Photo Reflection of the Day #242: Here Comes The Empire! 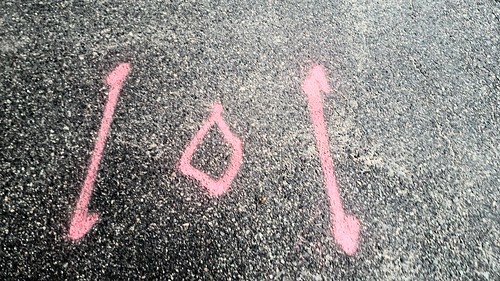 A spray-painted sign on the sidewalk of a two parallel lines with a diamond shape in between them--looking similar to the Tie-Fighters of Star Wars. I've wandered the streets of Beverly a lot since moving here on regular walks and runs. I have regularly stumbled upon this symbol on the ground. Now, I'm sure it has something to do with Beverly's public works projects and in all likelihood refers to something to do with underground pipes. But I can't help looking at them and seeing Tie-Fighters from Star Wars and wondering if the Empire will soon be invading Beverly and surrounding neighborhoods. We were worried about ISIS!?!?!? What happens when the Deathstar is knocking on our doors, right?